The cover for Melissa Savage’s latest book, Lemons. 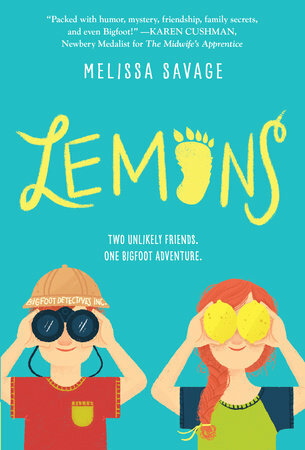 In Lemons, author Melissa Savage blends the comedy of the fish-out-of-water story and the zaniness of Bigfoot investigation with the real emotions of characters struggling with their individual losses. It’s 1974. The Vietnam War is over; Nixon’s quit the White House; and Lemonade Liberty Witt is being sent to live with her only surviving relative: her dead mom’s estranged father. While Lem banks on her 5th grade teacher requesting custody of Lem so she can stay in San Francisco, Lem must deal with all the rage and sadness of losing her mother, losing her place in the world, being under the care of someone she didn’t even know existed, and of being sent to a backwoods town that happens to be the Bigfoot Capital of the World. It’s this last item which helps Lem; her grandfather, Charlie; and Tobin, the cryptid-obsessed neighbor boy who’s father didn’t quite make it home from the war. Though Lem joins Tobin on his Bigfoot hunt because she has nothing better to do, the investigation allows them all to redirect their angers and griefs long enough to begin healing. Ms. Savage’s prose is crisp and well-paced. For a book full of people dealing with personal loss, Ms. Savage gives everyone’s emotions their due without overwhelming the characters, the story, or the reader. The characters consciously chose restraint in situations that—on TV, in movies, or in lesser works—would be amped-up for effect. 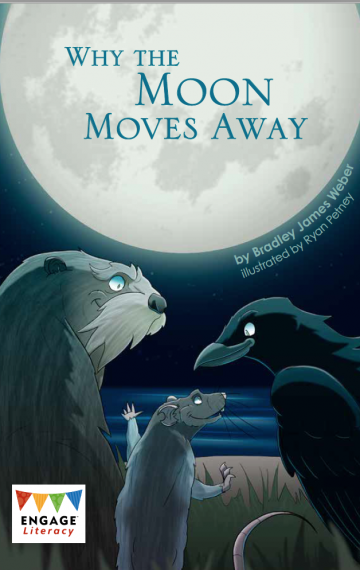 With any luck, young readers will pick up on this and see it as a better way to handle overwhelming emotions. Ms. Savage’s second book, The Truth About Martians hits shelves in early October. For your copy of Lemons, and to pre-order The Truth About Martians, visit Anderson’s Bookshop or your local independently owned bookstore. For more information about Melissa Savage, visit her website at https://melissadsavage.com/. 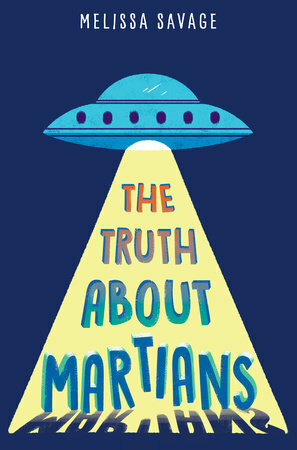 Cover for Melissa Savage’s forthcoming book, The Truth About Martians. Flog me for an idiot — and for thinking this review was on the site when it’s been in the DRAFTS folder the whole time. So, special thanks to the fine folks over at Brilliance Audio for sending the CDs and apy-polly-loggies to the same, O My Brothers and Sisters, for this on-the-job fall down. Gigante does, in a way, but not all the way — and that makes all the difference. When performing Hunter’s words from the RS articles and related correspondence, Gigante delivers a clear and precise reading toward the lower end of his register. The words come quickly and in bursts typical of the good doctors rhythms on The Gonzo Tapes and in recorded interviews. And Gigante easily keeps pace with and conveys Hunter’s changing tone, knowing when to give a straight read, push some rage, or adopt a floating wonder about the future — that kind of verbal ellipsis Depp managed so well in the Vegas movie. Reading from Jann Wenner’s intro and letters, or the material from Paul Scanlon, Gigante keeps it straight while maintaining an understated tension that may be a carry-over from his reading as Hunter or is his attempt to capture the energy of the time and place, and Hunter’s infectious whirlwind. Whatever the rationale — and even if there isn’t one — it works. 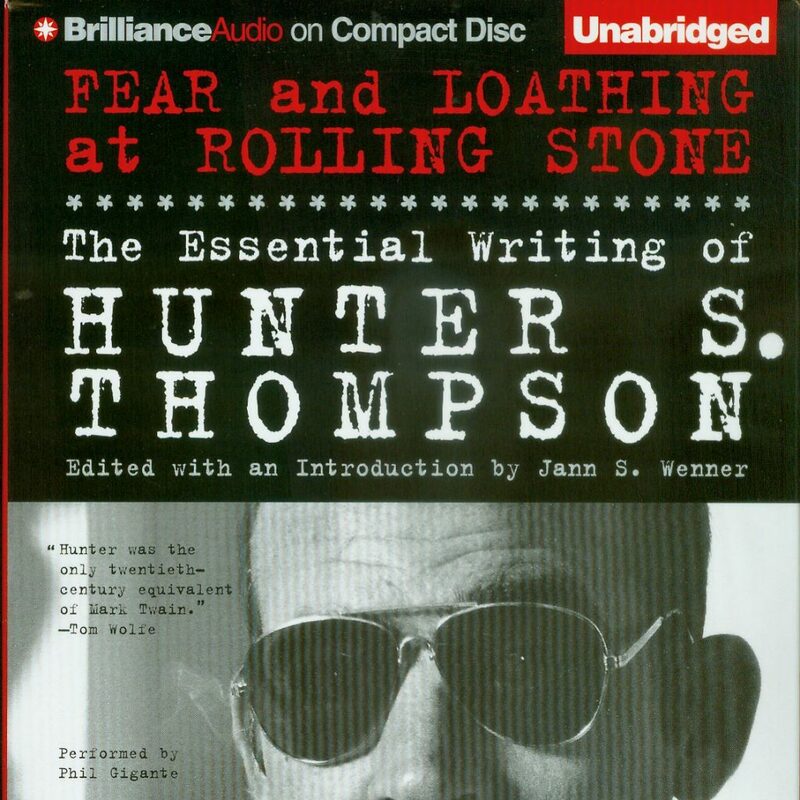 Brilliance Audio has done their typical high-end craftwork of assembling the right talent and crew for the job, making Fear & Loathing at Rolling Stone a terrific listen. Browse the Brilliance Audio catalog and buy recordings here.